Numark head lice repellent is a pleasantly fragranced special formulation containing Neem Oil, Eucalyptus Oil and Margosa Oil natural ingredients to defend and repel against head lice. Instantly detangles hair with added wheat proteins that leave hair conditioned, healthy and shiny. 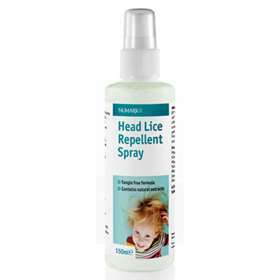 Numark head lice repellent spray is suitable for the whole family. Defends and repels against head lice. Spray liberally onto wet washed hair, massage into scalp behind ears and nape of the neck. Use at least once a day for maximum effect. It can also be used on dry hair between washes. If your child's says there has been an outbreak or you suspect your child has head lice daily use is recommended. If this happens wash out with plenty of clean water. Keep out of the reach of children. Do not use on children under 3 years, children under 6 should be supervised. for external use only. if irritation occurs, discontinue use. Aqua, PEG-40 hydrogenated Castor Oil, Cocodimonuim Hydroxypropyl, Hydrolyzed Wheat Protein, Ethanol, Sodium Benzoate,Potassium Sorbate margosa Extract,Melia Azadirachta Seed Oil, Eucalyptus Globulus Leaf Oil, perfume.